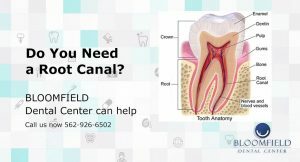 Bloomfield Dental Center | Top Cerritos Dentist > Blog > Dental Care > Do You Need a Root Canal? A root canal refers to the hollow part in the middle of each tooth. Contained within this cavity is the dental pulp, which is soft tissue containing the nerves. These nerves are responsible for sensing the temperature of food or anything that comes in contact with your teeth, whether it is hot or cold. The root canal procedure involves removing this dental pulp from within the tooth if it has become infected from bacteria. If you are feeling pain or extra sensitivity in your teeth, there is most likely an issue with the dental pulp, and a root canal is usually required to prevent the issue the worsening. There are several causes to this pain. One of these causes would be tooth decay or damage, where the deteriorating condition of the tooth surrounding the dental pulp exposes it more to the outside elements. Another reason would be from disease, where the dental pulp itself becomes infected and causes pain. Experiencing pain when eating, biting, or putting pressure on the teeth. Experiencing pain when teeth come into contact with something hot or cold. Experiencing tenderness in the gums around the tooth. Swelling of the gums that may spread to neck or face. Teeth becoming darker in color. If the root canal and dental pulp issue is not taken care of, then bacteria will continue to grow within the root canal. The bacteria and infection will continue to destroy your teeth and further the decay, which will lead to the extraction of the entire tooth because it will be too damaged to restore. It will also possibly spread to your gums and the rest of your body, creating other medical complications. Therefore it is very important to handle the issue as soon as possible.